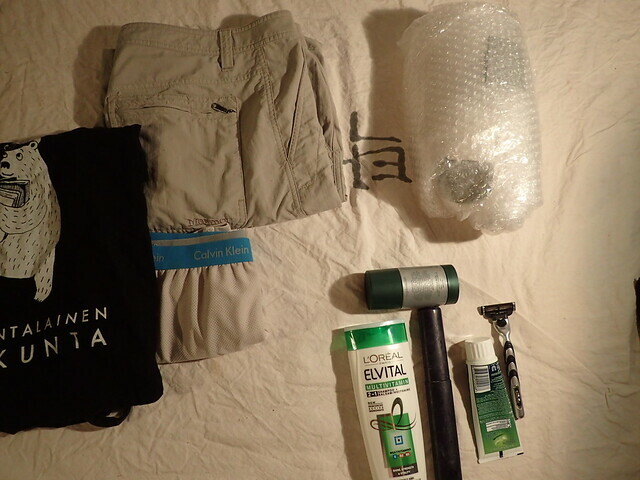 Another year, another Transcontinental race kit list. 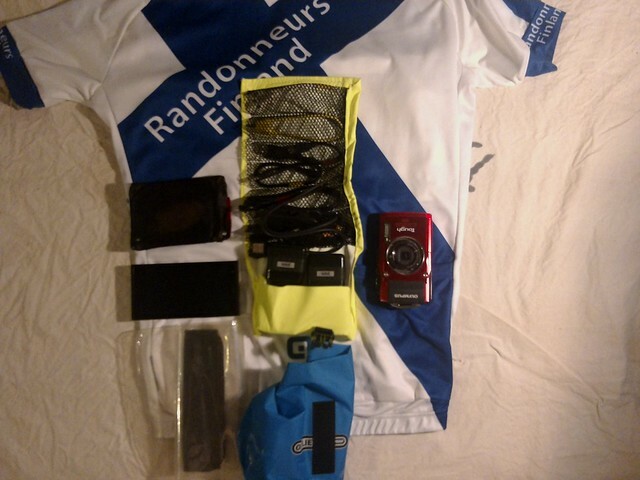 If you have followed my riding before, you’ve probably already read my 2014 kit list. I will occassionally refer to changes from last year. More photos in Flick album. I am riding my trustworthy old steed. Tunturi F500 frame from 2003 that has seen many incarnations from hybrid bike to frankenbike it is today. I changed tires from unreliable, but smooth (Vittoria open pave), to more reliable, but rough (Schwalbe Durano 25 mm). Rims were replaced and hence wheels rebuilt since last year. SON deluxe front dynamo hub and PowerTap rear hub. I am still afraid of the dark and am using the same setup of lights as last year. Busch&Muller Luxos U and B were both replaced as warrantry issues since last year. B had broken connector and U just stopped working. The newer model of U is better design, but has too-likely-to-get-lost external usb-port. In the scale of high impact to daily mileage, likely to get lost and impossible to replace this small cable is probably the worst. MyTinySun is mostly for long uphills, where dynamo is useless, and rough downhills where backup light is very important. GoPro 3+ and MyTinySun are mounted with KlickFix mounts. They are very steady and easy to use compared to most available mounts. The big change since last year is 3T aerobars. I usually vow for simple and aesthetic dashboard, but couldn’t really get it any better. For reference here is last year’s setup. 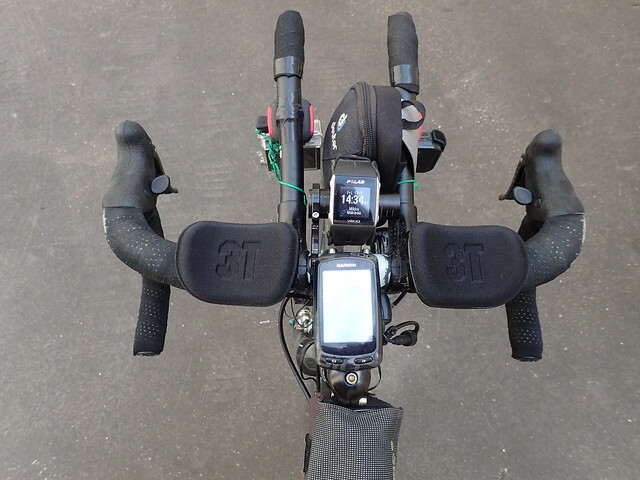 Garmin 810 is the same old, best of the garbage. Polar CS600 was replaced with ”state-of-the-art” V800. V800 has its share of problems. Probably worst is no battery level indicator so you can’t even tell if it is charging or not. Also I haven’t been able to figure out when it runs out of memory. It is however stable enough that I should have my daily stats available at Polar flow. 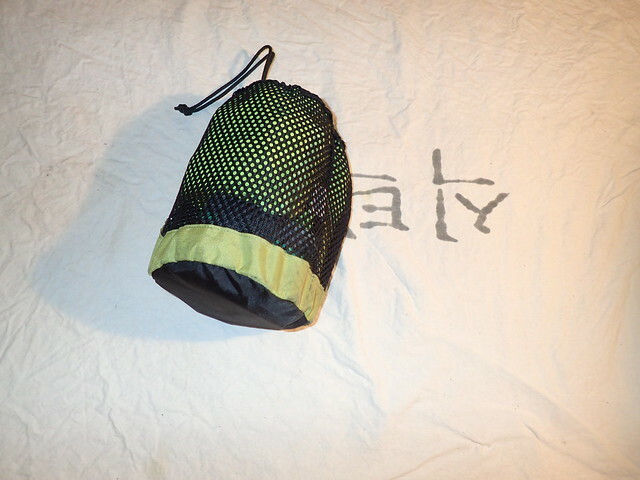 The small bag will be used to hold powerbanks, rag, spork and small parts when neccessary. Speaking of aesthetics. I was – this close to mounting 2nd B&M Secula to get symmetric rear view. Secula is always on to be visible and Niterider Solas is for blinding people behind me, should it be needed for some reason. It was also replaced since last year as warrantry issue as the old one drowned at Alps during last year’s Transcontinental race. 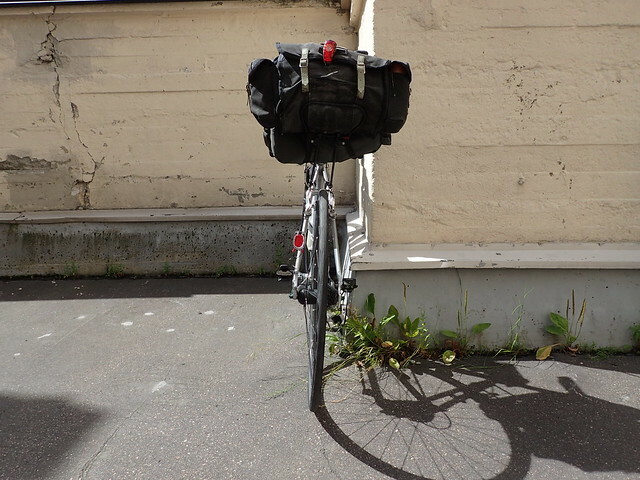 The front top tube bag is for food and the, my precious, B&M usb cable. 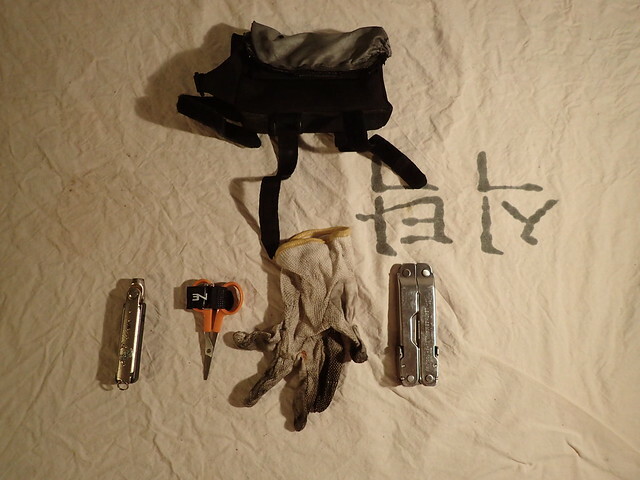 The other bag is for tools and work glove. Triangle bag is for always needed extra clothes. 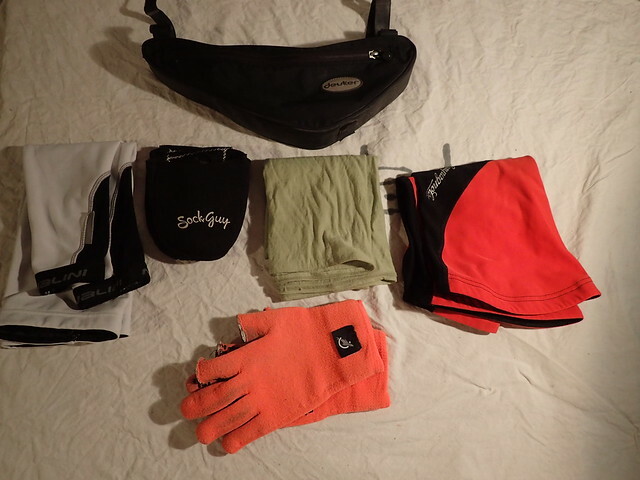 Arm warmers, leg warmers, buff, shoe covers. Exactly the same as last year. Tools are also pretty much the same as last year. 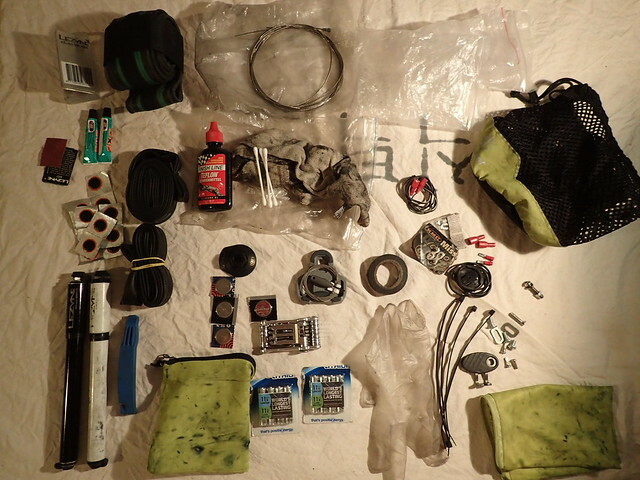 Tools are packed in Carradice bag’s main compartment. Also in the Carradice main compartment are the spare cloths, and some extra food. 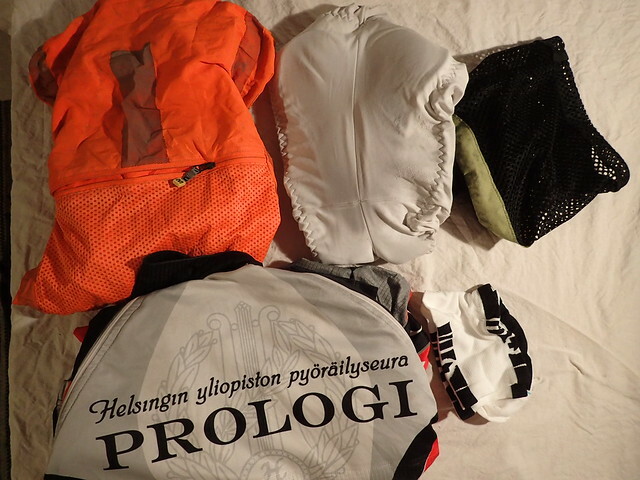 One pair of socks, Kalas mission jacket, bibs and Mavic Vision reflective wind vest. 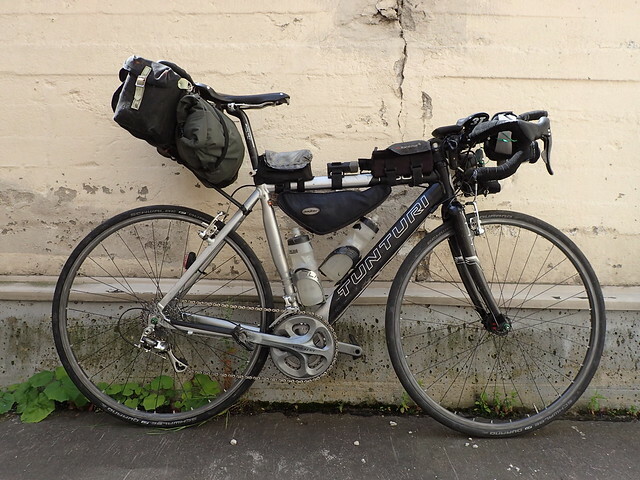 In Alpkit bag under saddle there is bubble wrap for sleeping. Clothes to be used during breaks. I left shirt and shoes off from the list this year. Some shampoo, toothpaste, toothbrush, deodorant and razor. As I will not be using a hip bag this year there were some changes in the side pockets of Carradice. 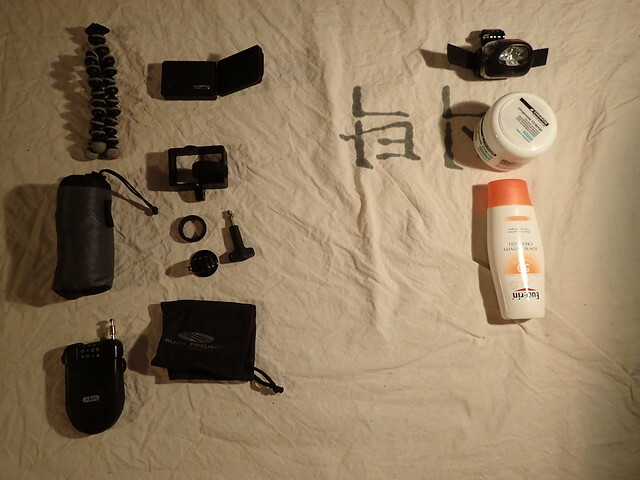 Right pocket Assos chamois cream, sun lotion, space blanket (not in photo) and Petzl Tikka 2 xp headlamp when not in use. 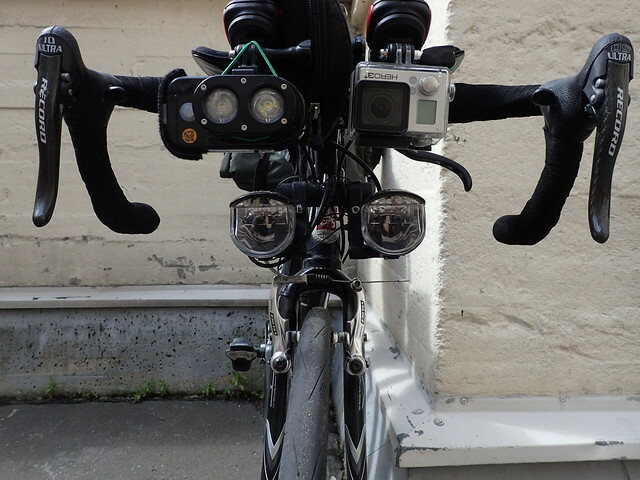 Headlamp has GoPro mount retrofitted in it. Left pocket has packable backpack (lost my old one and got a waterproof Sea-to-Summit instead), cable lock, GorillaPod and bag of GoPro spares including extra battery. Finally the kit I’m actually wearing. Pretty much the same as last year. 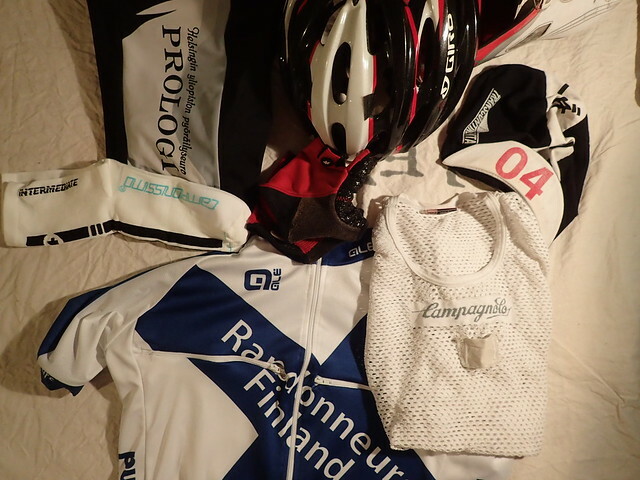 Sworks shoes, Assos gloves, shorts, jersey, cap (2014 edition in photo for obvious reasons :)) and Assos socks. As mentioned earlier I don’t have hip bag this year. 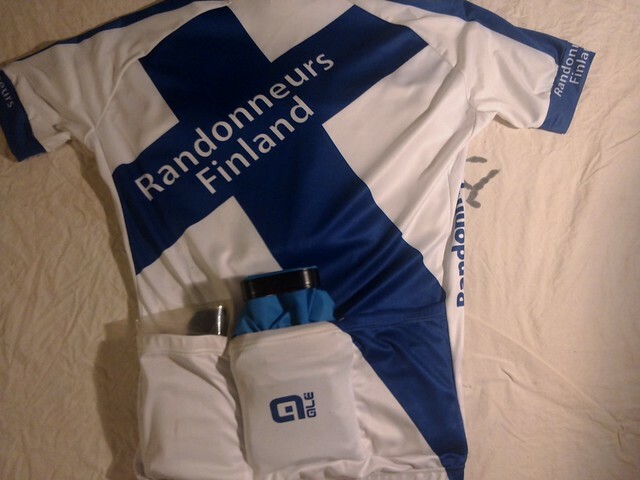 Hence I had to make a few extra pockets to my jersey. One for documents and another for primary mobile phone. Left rear pocket has secondary mobile and wallet. 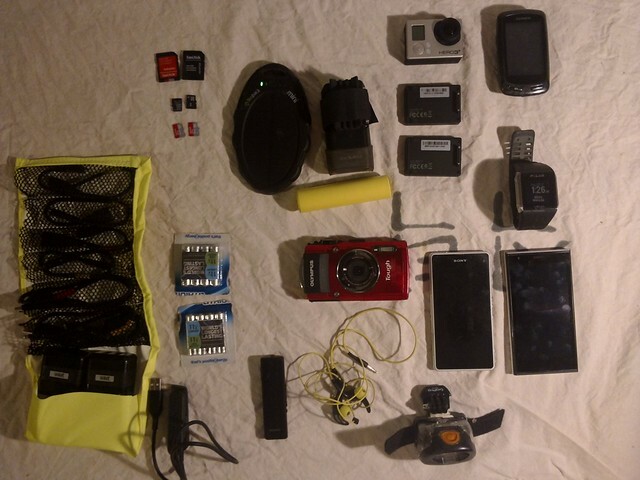 Middle pocket has 2 2x usb chargers, cables and occasionally a power bank in a homemade organizer packed in Ortlieb waterproof bag. Cables include 3x micro usb, 2x mini usb, 1x Olympus usb and 1x Polar V800. Polar V800 is another likely-to-get-lost-high-impact cable along with the B&M usb. Right pocket has Olympus TG-3 camera. And same as it is used. 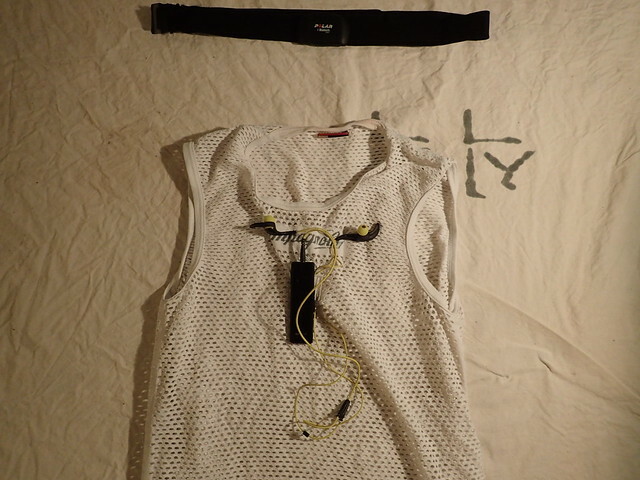 My undershirt has a homemade SBH-52 handsfree mount. It is easy to start and stop using the ear plugs with this setup. Most of the electronics in same photo. I have 3 power banks, Tespack also has solar charger, that are held where they happen to be needed.